Personalized roman numeral wedding ring with your special date and your choice of gemstone or diamond in 14k, 18k white, yellow or rose gold and platinum. 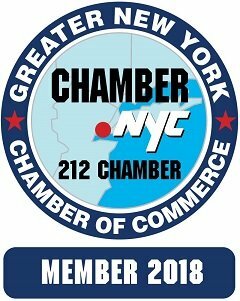 Order Now, Ships on day-name month-number/day-numberOrder Now, Ships in 13 business days. 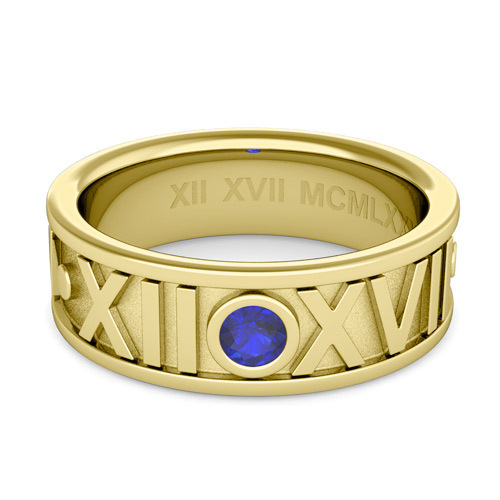 This roman numeral ring features a solitaire blue sapphire bezel set in a 7mm 14k gold wedding band with your special date converted to Roman numerals. 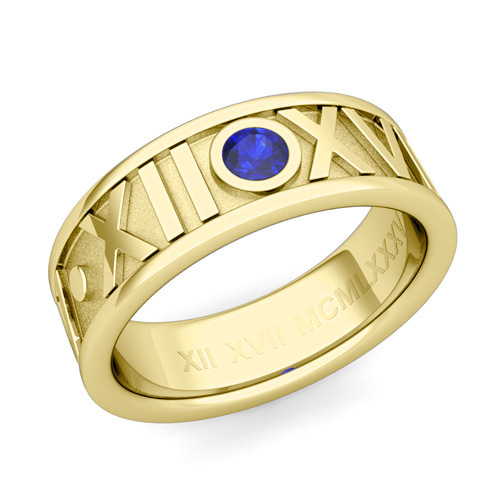 This roman numeral ring features a solitaire blue sapphire bezel set in a 7mm 18k gold wedding band with your special date converted to Roman numerals. This roman numeral ring features a solitaire blue sapphire bezel set in a 7mm platinum wedding band with your special date converted to Roman numerals. This roman numeral ring features a solitaire pink sapphire bezel set in a 7mm 14k gold wedding band with your special date converted to Roman numerals. 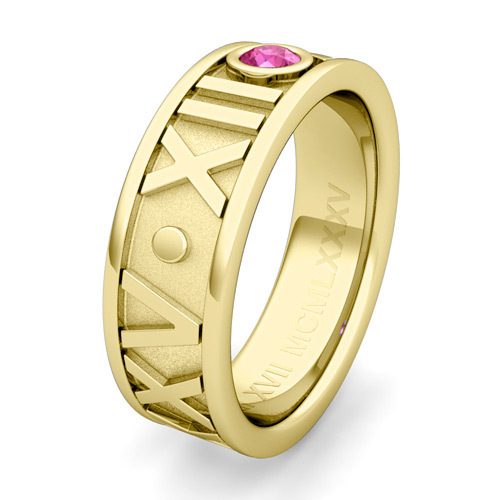 This roman numeral ring features a solitaire pink sapphire bezel set in a 7mm 18k gold wedding band with your special date converted to Roman numerals. This roman numeral ring features a solitaire pink sapphire bezel set in a 7mm platinum wedding band with your special date converted to Roman numerals. This roman numeral ring features a solitaire yellow sapphire bezel set in a 7mm 14k gold wedding band with your special date converted to Roman numerals. This roman numeral ring features a solitaire yellow sapphire bezel set in a 7mm 18k gold wedding band with your special date converted to Roman numerals. This roman numeral ring features a solitaire yellow sapphire bezel set in a 7mm platinum wedding band with your special date converted to Roman numerals. This roman numeral ring features a solitaire ruby bezel set in a 7mm 14k gold wedding band with your special date converted to Roman numerals. This roman numeral ring features a solitaire ruby bezel set in a 7mm 18k gold wedding band with your special date converted to Roman numerals. This roman numeral ring features a solitaire ruby bezel set in a 7mm platinum wedding band with your special date converted to Roman numerals. This roman numeral ring features a solitaire emerald bezel set in a 7mm 14k gold wedding band with your special date converted to Roman numerals. This roman numeral ring features a solitaire emerald bezel set in a 7mm 18k gold wedding band with your special date converted to Roman numerals. This roman numeral ring features a solitaire emerald bezel set in a 7mm platinum wedding band with your special date converted to Roman numerals. This roman numeral ring features a solitaire diamond bezel set in a 7mm 14k gold wedding band with your special date converted to Roman numerals. This roman numeral ring features a solitaire diamond bezel set in a 7mm 18k gold wedding band with your special date converted to Roman numerals. This roman numeral ring features a solitaire diamond bezel set in a 7mm platinum wedding band with your special date converted to Roman numerals. This roman numeral ring features a solitaire black diamond bezel set in a 7mm 14k gold wedding band with your special date converted to Roman numerals. This roman numeral ring features a solitaire black diamond bezel set in a 7mm 18k gold wedding band with your special date converted to Roman numerals. This roman numeral ring features a solitaire black diamond bezel set in a 7mm platinum wedding band with your special date converted to Roman numerals.